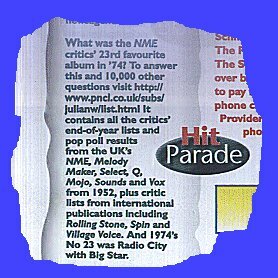 This site has absolutely NO connection with New Musical Express, Q, Mojo, IPC Magazines or any other publication. It has been put together by Julian White as a public service and a labour of love. Questions regarding subscriptions etc. please visit the F.A.Q. page. 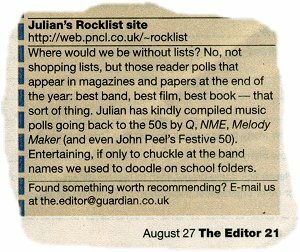 or RockList News/Discussion forum. NO Cookies to clutter up your system while browsing this site. Can I send you some Lists? Yes. But please check with me first as someone may already be typing the same list up or the list may be on the site and you just may not have found it. Do you have a site search facility? Yes, the RockList search now works using Google. All the lists on the site are indexed chronologically on The Year Index page . How Do I Make Lists From My iPod Library? Two ways of doing it – maybe more. view – goto Edit – Select All – Copy – Paste it into your favourite spreadsheet program. From there it can be edited to your desired layout.